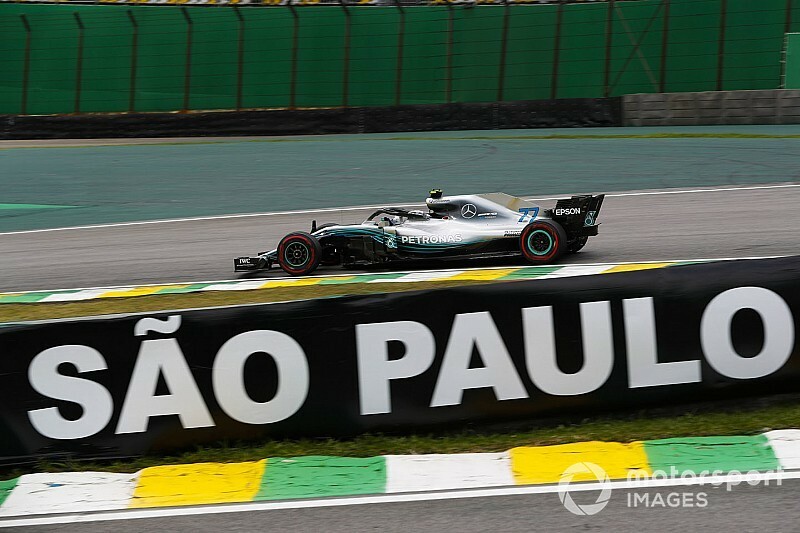 Mercedes driver Valtteri Bottas topped the second Friday Formula 1 free practice session for the Brazilian Grand Prix at Interlagos. 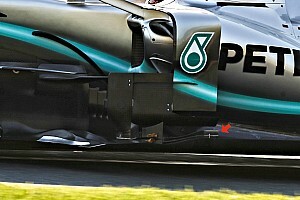 Bottas posted a best time of 1m08.846s using supersoft Pirellis, with Mercedes teammate Lewis Hamilton missing out on beating that time by just three thousandths of a second. This was primarily down to Bottas having a pace advantage in the twisty middle sector, as Hamilton had the edge in the shorter first and second sectors. Sebastian Vettel ended up third fastest, just 0.073s behind Bottas having briefly held top spot despite complaining of something rattling around in the cockpit on both that run, and an earlier one. "There's still something loose, jumping back and forth," said Vettel after setting his best lap, with Ferrari continuing its investigations once he returned to the garage. Red Bull driver Daniel Ricciardo was fourth fastest, 0.318s down, while teammate Max Verstappen missed much half of the session with a possible oil leak. He returned to the track and initially slotted into sixth place with his pace on soft rubber before moving ahead of the second Ferrari of Kimi Raikkonen into fifth. Haas driver Romain Grosjean won the midfield battle in seventh, outpacing Sauber's Charles Leclerc by 0.174s. Kevin Magnussen backed up his teammate's pace with ninth fastest time, just ahead of the leading Racing Point Force India of Esteban Ocon. Sergio Perez slotted in behind in the second Force India, although he spent much of the session in the garage after his early run due to a steering issue, only returning to the track during the final 15 minutes. Toro Rosso driver Pierre Gasly pipped McLaren's Fernando Alonso to 12th place by just 0.002s, with the duo ahead of the Renault of Carlos Sainz. 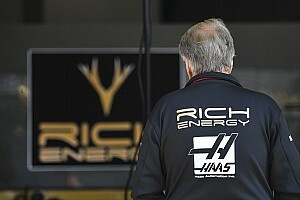 Sainz lightly brushed wheels with Grosjean's Haas in the closing minutes of the session at Turn 1 when both were on long runs. Marcus Ericsson was 1.686s off the ace in the second Sauber in 15th, ahead of the lead Williams of Sergey Sirotkin, who shaded McLaren's Stoffel Vandoorne and teammate Lance Stroll. Brendon Hartley was slowest of those to set a lap time on supersofts, lapping just under a second slower than midfield standard-setter Grosjean. The session was stopped after just nine minutes after Nico Hulkenberg crashed his Renault coming out of Turn 14, the Juncao left-hander that leads onto the flat-out drag to the line. Hulkenberg put his right-side wheels on the grass behind the kerb at the exit, and spun into the barrier as he tried to follow the circuit as it continued to turn left. The car suffered an impact at the right rear, then the right front, and Hulkenberg could play no further part in the session and was classified based on his early pace using medium Pirellis.